Tú estás aquí: Inicio / Material de estudio / Is Karate-do Okinawan or Japanese? Is Karate-do Okinawan or Japanese? Another vision and different opinion, to read. This short review will try to summarize a question that immediately arises when someone interested in Karate-do history starts his or her research and begins to know more about it’s history and it’s creation. This article is the natural result of another article written on Yoshitaka (Gigo) Funakoshi, included in this WWW Home Page. All must already know that Master Gichin Funakoshi learnt Karate (The Hand of Tang, as the old ideograms could be read or empty hand) under Yasutsune Itosu and Yasutsune Azato, both Great Okinawan Masters, though Azato seems to have been more notoriously so. It must also be common knowledge that O-sensei was the first karateka to teach Karate successfully in Japan’s mainland, starting his work there in 1922. Using historical photographs, interviews and written information, it is clear that the Karate style Master Funakoshi taught differed, technically, only slightly from other Okinawan styles. During the thirties there was a progressive development of the technique due to O-sensei, this together with the modification of Karate towards a real Japanese Martial Art, a Budo, where his influence had a crucial significance and one of the reasons why he is called the “Father of Karate-do”. 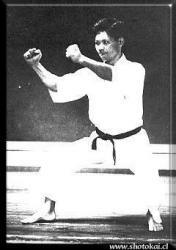 With Yoshitaka’s involvement in Karate-do, the technical developments and changes were spectacular and seminal, modifying the style that had been practiced until that moment. The high stances were replaced with low, forced stances, this included a a perpendicular lower leg with respect to the ground, the knee over the big toe, these changes immediately shot the effort and roughness of the training to a new dimension, and put a strong pressure on the mental and physical practice of Karate-do and it’s followers. There has always been speculations on Gigo’s inspiration that is responsible for the low stances, some suggest it was Kendo, a Martial Art, he practiced, that was an inspiration for kumite training (combat). This is hard to believe, considering that Kendo does not use stances nearly as low as those established by Yoshitaka, it seems to have been an original development due to Gigo’s genius. Besides these changes, new kicks were developed together with changes in the general body stance (hanmi in the blocks and tsuki) and in the fist tsuki (blows) were created by Yoshitaka and his collaborating group, all enriched the Okinawan Karate techniques and the limited reservoir of kicks that the original style had. If we, together with these, include the standardization of a wide variety of Kumite practices and a strong emphasis on the high repetition of techniques as a means of developing techniques plus the strong changes on the existing Kata, (some ending up almost unrecognizable) and the creation of new kata, we have in my opinion, a clear divergence of Karate-do from Okinawan Karate, surely enough to say a Japanese Martial Art was created. This would have been left clear with the use of the name Karate-do and the use of the new kanji for Kara, without the Chinese influence. But all the Okinawan Masters after much dispute over many years in newspaper articles against Master Funakoshi’s name change, they accepted it and included it in almost all the Okinawan styles too. This took place in 1936, when all the best known Okinawan Masters got together, among them, Kyan, Hanashiro, Miyagi, Motobu, Yabu, Gusukuma, Maegusuku and Chibana, at that moment they accept the new denomination Funakoshi used many years before it was formally established in the book Karate-do Kyohan. Today it you often encounter Okinawan style representatives talking about only two or three original styles and that all the rest of Karate is just a modification of these original few. I hope that after reading this article, it is clear that Shotokai Karate-do or Budo, due to Master Funakoshi and his son Gigo Funakoshi’s influence has very little left of it’s Okinawan precursors and to think that it is Okinawan is to have a superficial knowledge of Karate-do’s history. To do so would just like saying that Taek Won Do is Karate-do (as everybody knows Karate-do had a very strong influence on Taekwon Do, but nobody would call it Karate-do) the differences between Okinawan Karate and Gichin-Yoshitaka Funakoshi Karate-do are just as big. No other style has had as big a Yoshitaka influence as Shotokai, this is due to the fact that his closest friends and collaborators were Shigeru Egami and Genshin Hironishi, both Presidents and Chief Instructors of Shotokai and the Shotokan dojo, in successive period till our days. Two other people that had strongly influenced the future developments and changes in Karate-do after Yoshitaka and Gichin Funakoshi’s deaths, never trained under Gigo Funakoshi, I am talking about Isao Obata and Masatoshi Nakayama, they lived outside Japan during those crucial years, they never got to know him well or maybe never met him. The effect these karatekas had on Karate-do (creating Nakayama among other aberrations sport karate) would maybe have been different had they known and trained under the guidance of what many consider the greatest genius of modern Karate-do. In my mind, it is perfectly clear that Karate-do as created by the Father-Son combination, Gichin Funakoshi-Yoshitaka Funakoshi, was an original and Japanese phenomenon, something new with a clear influence of it’s Okinawan roots. With this in mind, Shotokan (pre 1950’s) and Shotokai (post 1950’s) is a Martial Arts style clearly distinguishable by it’s technique and it’s own philosophy, independent and original respect to Okinawan Karate, having a retroactive influence on it’s own roots, the Okinawan Karate styles. https://thetraditioncontinue.com/wp-content/uploads/2018/06/logo-redis.png 0 0 The tradition continue https://thetraditioncontinue.com/wp-content/uploads/2018/06/logo-redis.png The tradition continue2018-04-11 12:21:402018-06-28 00:25:01Is Karate-do Okinawan or Japanese?